A knee walker is used in place of crutches and when crutches may be difficult to use. 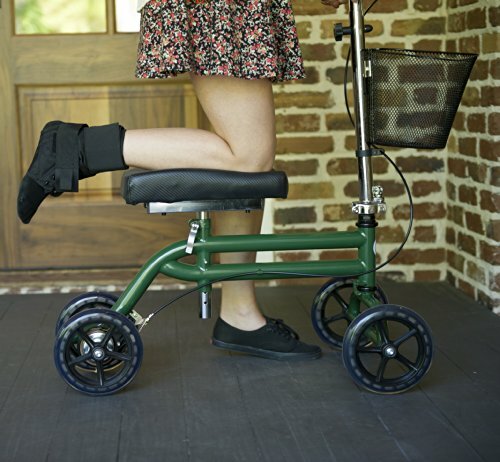 The purpose of a knee scooter is to keep the injured leg/knee immobilized while still allowing mobility. 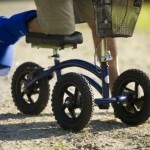 With the added mobility and independence of the best knee scooter being used during recovery of an injury or surgical procedure, there is no loss of independence and quality of life is enhanced. For many active people, an injury forces them to stay in bed or on a couch with limited movement. 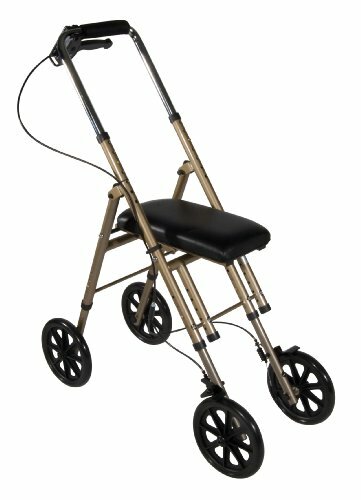 A knee walker, provided it is approved by your medical professional for use during rehabilitation, keeps active people moving and healing at the same time. This is especially true for individuals who live alone and would otherwise have to rely on outside help for simple household chores. Are you tossing up between old fashioned wobbly crutches or a knee scooter. 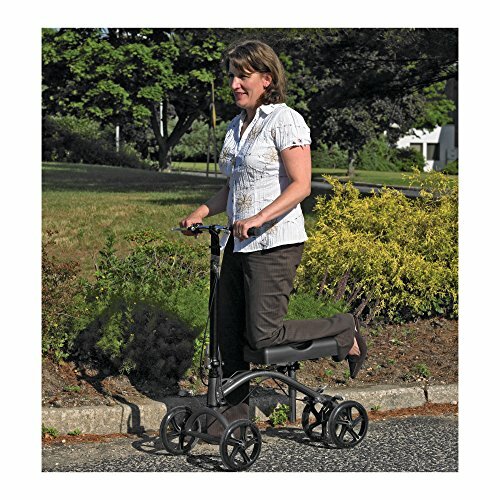 A knee scooter eliminates the need and cost of additional assistance and they are designed for comfort and ease of movement in and around the home or outdoor environments. Essentially there are only two main types of knee scooters. Those that are designed for indoor use and those intended for outdoor use. They are typically easy to identify as the outdoor ‘all-terrain’ styles have heavier wheels or wheels that have a heavier looking tread to handle different surfaces much as an all-terrain vehicle has wider tires than a normal vehicle. 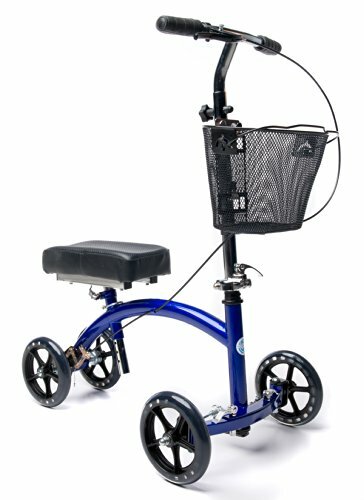 Mac reviews the Best 4 Wheeled Medical Scooters for being independent. The framing may also be made of a larger and heavier gauge pipe or metal material. The indoor models will be much lighter in weight, have non-marking tires and smaller wheels and other features that would be required most for indoor use than for travelling outdoors. The braking systems would be different along with overall construction and design. Some deluxe models feature hand operated braking systems on the handle bars for immediate stopping ability. This braking system also has push button brake locks for parking. Some braking systems are the good old fashioned use your own foot brake. There are many designs that are considered ‘crossover’ and are labeled as all-terrain which operate perfectly well in either indoor or outdoor environments. The model you choose will depend on your needs. Our reviews will help take the indecision out of your mind. 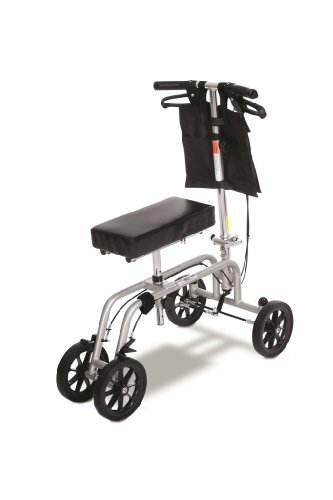 What makes Drive Medical DV8 Aluminum Steerable Knee Walker stand out is that the design features forward-facing front wheels which are completely maneuverable in any direction. This innovative crutch replacement makes this model the perfect solution for recovering from breaks, foot surgery, leg / ankle sprains, leg amputation, or ulcers of the foot. 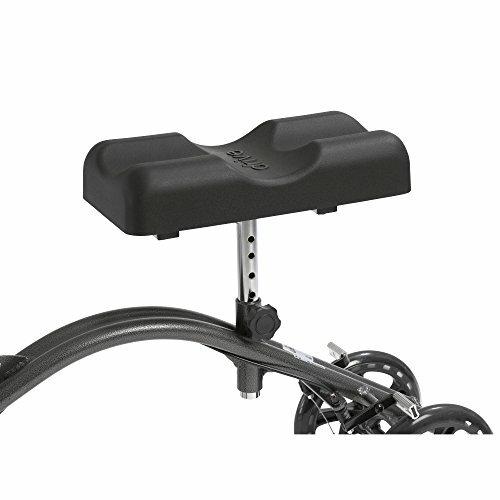 Weight can be safely supported on the padded seat which has a channel to keep the leg securely placed. You don’t need to feel isolated, or worry about the lack of stability a crutch doesn’t offer. 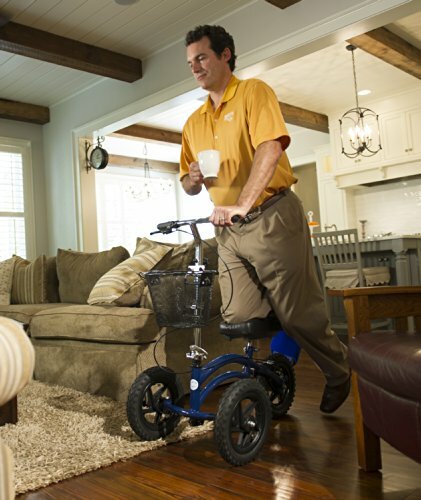 You can keep up with the family, visit friends, go shopping, out for a coffee or visit the neighbors with the Drive Medical DV8 Steerable Knee Walker. The large 8 inch wheels cover ground with ease for a smoother ride than small wheels. Small wheels make for extra bumps and have difficulty traveling over rougher ground, especially if you go on grassed areas. They get stuck too easily! The DV8 wheels can safely take you over grassy areas, gravel / dirt paths, uneven footpaths and any other surfaces…. There are 2 channels, 1 for when you are riding about and 1 for when you are resting, say when you are watching TV and needing to elevate your leg. Simply turn your scooter to sit horizontally in front of you and you have an instant leg rest. The actual size of the knee pad measures 7.25″ wide and 14.25″ long. And if you need to adjust to raise or lower the knee pad depending on your height, the range is 17.5″ at it’s lowest and 21.5″ at its highest. The handle bars can be adjusted without the use of tools. The height range is 33″ to 37.5″ at the highest. There is a lever at the base of the scooter column you release to either lower or raise the handle bars. There are no tools needed for adjusting. Once they are at the right height, tighten the lever and you are good to go. Knowing you can brake quickly and safely when needed is vital. Being able to stop suddenly knowing you won’t take a spill is enormously reassuring. The Drive Medical DV8 Steerable Knee Walker adjustable dual hand brakes ensure your safety and security when in use. 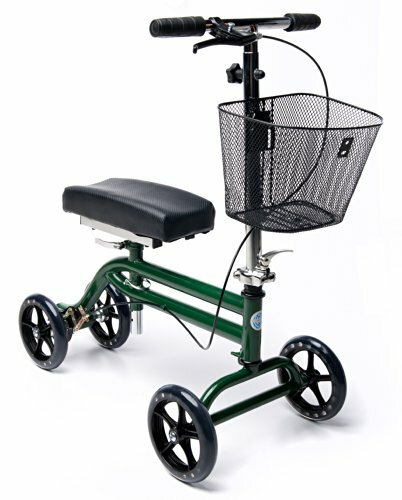 The Green KneeRover Steerable Knee Scooter is designed for use indoors or outdoors. KneeRover proudly say ” We are passionate about giving you the Freedom to Move during your recovery period. We are committed to providing innovative and affordable mobility solutions to get you moving as soon as possible after injury or surgery and for the duration of your recovery. The long rectangular knee pad platform measures 3.5-inches thick and is contoured for a comfortable and firm fit. The complete size of the actual knee pad measure 6.5″ width x 12.5″ in length. No tools are needed for changing the height, there is a quick release lever to move. The locking handbrake and rear disc brake are fully adjustable as is the handlebars and knee platform to ensure a good fit. 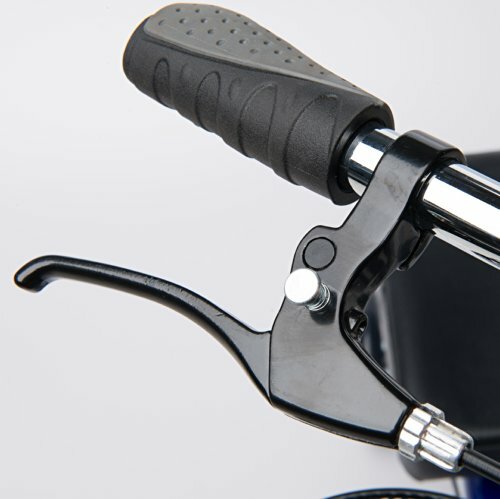 The handlebars also fold for quick transport or for storage purposes with a quick release lever. The manufacturer suggested weight limit is 300-pounds and the knee roller is recommended for use of individuals between the heights of 5-feet and 6-foot-6. There is also a free basket that comes with this model for easy carrying of small items. 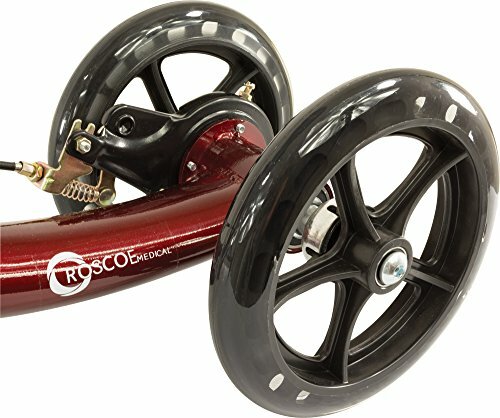 The Roscoe Knee Scooter has over 20 years of experience behind its design and production. Roscoe is committed to delivering top quality products to help their customers live healthier, more comfortable and independent lives. Roscoe know you want to live an active life of keeping up with your children, having fun at the park with your kids, going on holidays or being able to watch the gridiron, football or cricket. The large 8-inch clear PU wheels with sealed bearings make for smooth movement and is completely steerable. 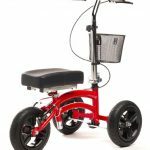 This all terrain scooter is designed for use both indoors and outdoors and the adjustable padded aluminum knee platform is mounted on an offset post making right-to-left configurations quick and easy. There are no tools required for any adjustments to this product and it has a thumb release lever to assist it in folding up for storage or transport. 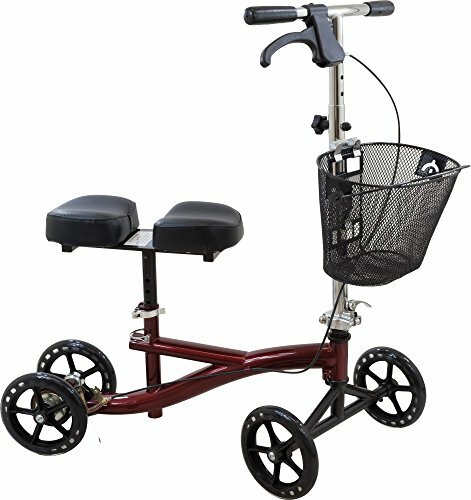 The Roscoe Burgundy Knee Scooter comes with an easy folding mechanism, collapsing with a thumb release lever and folds up and fits beneath the raised knee platform for storage and portability. No longer are you stuck at home, or depending on dangerous crutches for balance and support. You can carry your breakfast or coffee to the table, walk the dog, go shopping to your favorite shops, make meals, clean the house- no- maybe leave that to someone else:) and work with 2 free hands and so much more! The manufacturer recommends this scooter can be used by individuals up to 350-pounds. This KneeRover KneeCycle is promoted by the manufacturer as “one of the most advanced knee walkers in the industry” and it is a great alternative to crutches. The design of this particular scooter allows for complete stability and control when used. This model employs an advanced automotive style tie-rod steering design which is not commonly used in knee walkers. The frame is a heavy duty frame made to handle any terrain indoors and outdoors. This is one of the more attractive looking models from KneeRover with its arching blue center bar and curved front bar between the wheels. This KneeRover Deluxe model has a comfortable 3.5-inch thick contoured foam knee platform that easily converts from left-to-right leg compatibility. The 4 large 7.5-inch non-marking rubber wheels make your trip anywhere smooth and relatively hassle free. 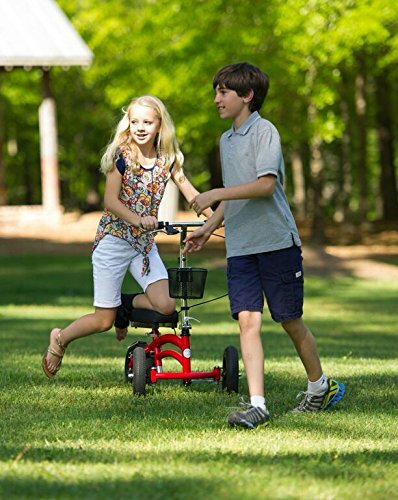 Larger wheels offer a much smoother ride than small wheels. When you are looking at buying a knee scooter, remember to check the wheel size. There is also an adjustable disc handbrake, plus rear disc brakes for instant and consistent braking. When you have an injured leg and recovering from an operation, you want to feel comfortable knowing you can stop the second you want to or need to! There is also a large free basket thrown in, making it perfect for use indoors or outdoors. The basket dimensions are 7.5″ x 12.5″ x 8.25″ giving you plenty of room to take your personal belongings along. The handlebars are fully adjustable to create the perfect fit and the front axle plus handlebars can be removed for transport or storage. The actual handle bars are a good size to grip comfortably at 7/8″ in size and feature Ergo Dynamic Easy Clean Rubber grips for user hand comfort. The handle bars adjust to their lowest height at 37 inches and raise to a maximum height of 45 inches. Again, it all depends on your height. Height adjustment is tool free with the quick release lever feature. The manufacturer says this knee walker is ideal for individuals up to the weight of 300-pounds and stand between 5-feet and 6-foot-5-inches tall. 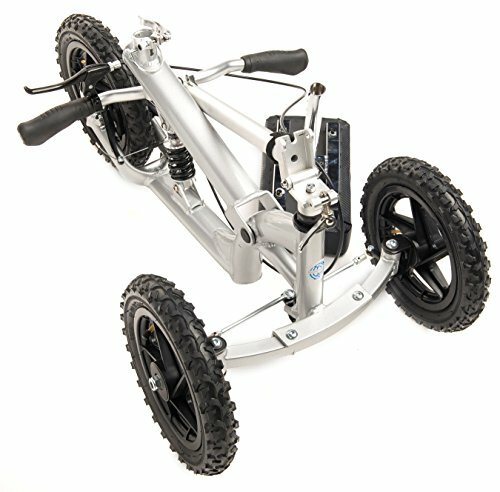 Designed for use indoors and outdoors, this heavy duty, sturdy All Terrain Knee Rover Steerable Knee Scooter is the best knee scooter for heavy duty use. Go where you want, when you want with this amazing model from KneeRover. This is a design guaranteed to please with its steady and secure performance. 12-inch air filled pneumatic tires which mean you can travel over all kinds of terrain – flat or uneven. Forget clunky and unstable crutches which strain your back and shoulder muscles. 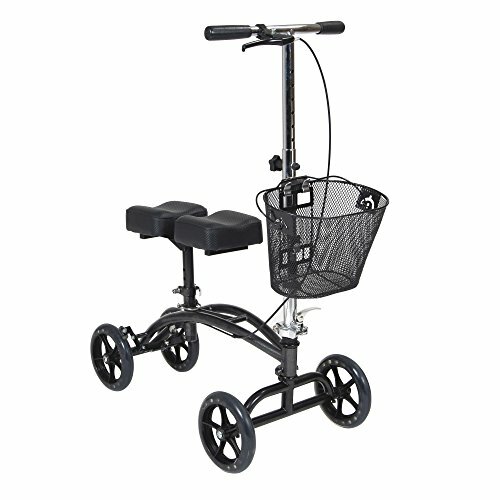 By choosing this ” Rolls Royce” of the best knee scooter from the KneeRover range, you are choosing to look after yourself wisely. The level of independence and freedom provided are exactly what KneeRover want for their customers. An advanced automotive style tie-rod steering design makes maneuvering easy, stable and controlled. 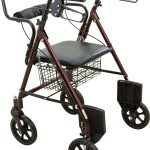 The heavy duty double bar frame construction provides added strength and there is a locking handbrake. 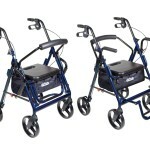 The fully adjustable handlebars and knee platform are foldable making the knee walker easy to transport and store. 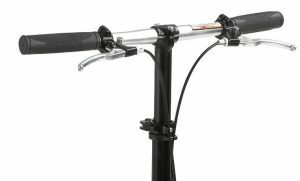 The handle bar height is simple to adjust with the flick of the quick release lever located at the base of the handle bar column. It can be lowered to as much as 34 inches down and to raise up for taller people to a maximum height of 47 inches, making it suitable for taller people. It’s one of the few models catering for tall people. The knee platform is designed from molded foam which is also padded for superior comfort and fit. Measured from the ground, the lowest position is 19 inches and raised to the highest position at 22.5inches. The manufacturer says it is best suited for individuals between 5-feet and 6-foot-5 in height and has a weight limit of 400-pounds. The three key features to this well made and sturdy Isokinetics knee walker is a removable basket, wheels that are non-marking and locking brakes. There’s also a bell. Made with a durable steel frame, this particular model, the Drive Medical knee walker is completely steerable and has a basket mounted on the front that can be removed. 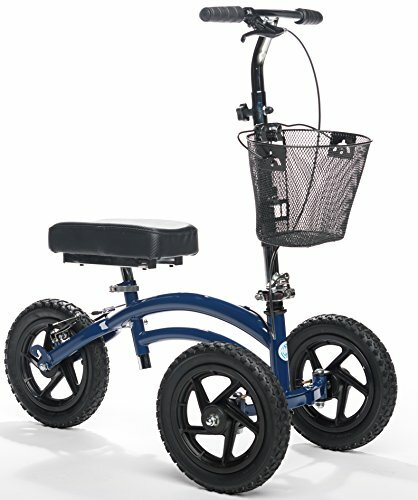 Designed specifically for small adults and children, this indoor/outdoor KneeRover knee scooter has 10-inch pneumatic tires and is fully steerable. 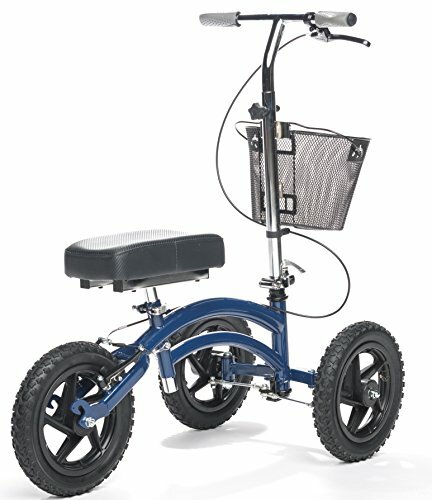 Featuring 8-inch caster wheels, this unique style of the Drive Medical knee walkeris perfect for indoor or outdoor use. Frame construction is strong, durable and lightweight. 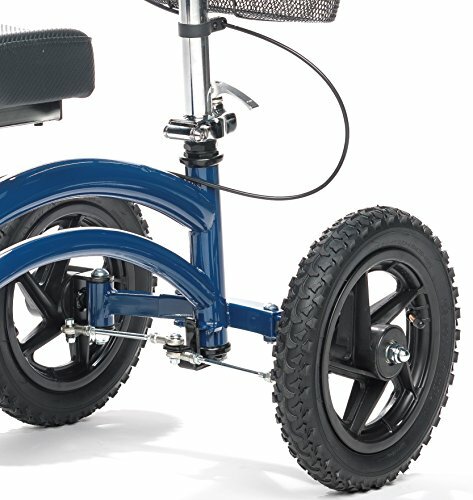 The complete frame is adjustable including the knee platform (which can convert from left to right easily), and handlebars allowing for a perfect fit or for easy transport or storage. The knee platform contains padding which makes it comfortable for extended periods of time. 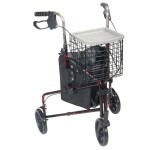 The padding also allows for a firm place to hold your lower leg when using the knee walker. The adjustments can be made without the requirement of tools and this product has a 300-pound weight limit. This newly updated version from the best selling brand KneeRove is the All Terrain Pro has innovation written all over it from the backpack mounted on the front instead of a basket to the indoor/outdoor 12-inch pneumatic tires. The lightweight aluminum frame employs an Integrated Shock Technology that translates into the smoothest, most comfortable ride on any surface. A tie-rod steering design provides solid, stable steering and there is also an adjustable locking handbrake. The double bar heavy duty construction is strong, durable and easy to maneuver. There is a 400-pound weight limit on this knee walker and a height recommendation of between 5-feet and 6-foot-5. 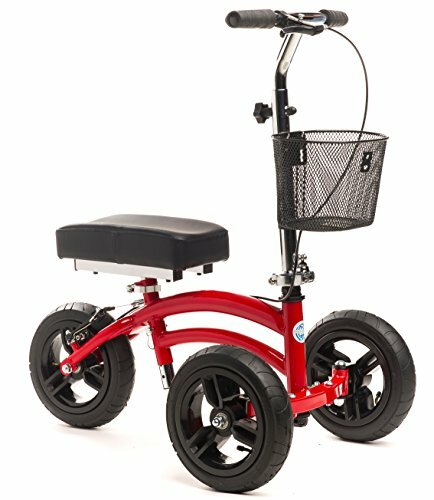 The State of the Art design of the essential Medical Supply knee scooter provides an over 30-percent turning radius and is the first of its kind to have loop hand brakes. Another innovation never before seen in the knee walker industry is the widest flat free tires for additional stability indoors or outdoors. The manufacturer recommends a weight limit of 400-pounds and height limits between 5-foot-4 and 6-foot-6. 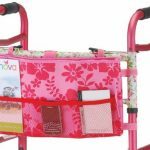 There is also a lifetime limited warranty on the frame which folds for easy storage or transportation. The crutch alternative is clearly a knee walker but which one? It depends a lot on your personal size, the surroundings you plan on using one in and whether or not you are attracted to or require extra features. The basic models are as good as the higher end ones, only they do not have as many features. 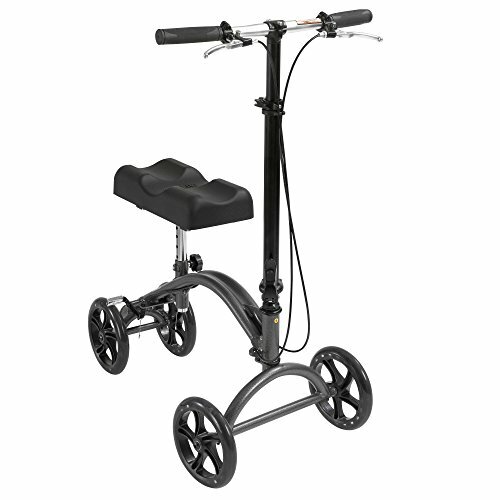 Items you will require of any knee walker will include easy adjustments that can be made to both the knee platform and handlebars. 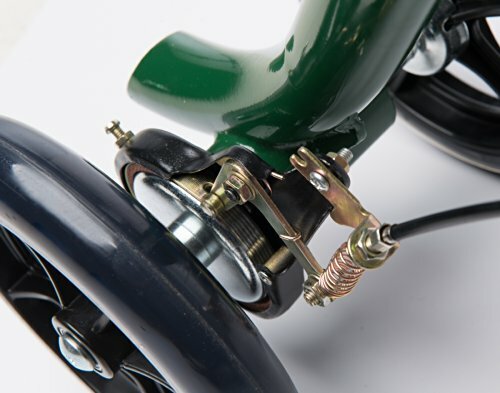 Steering would be another feature required from any of the best knee scooters as well as a braking system of some kind with a locking parking brake being a preferred option. 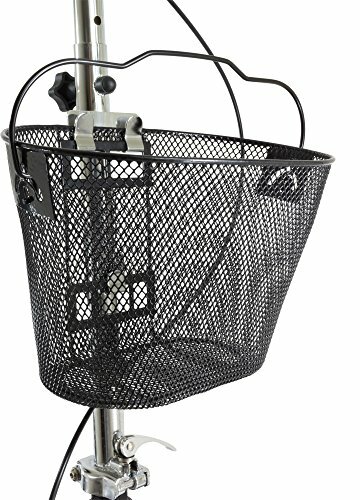 A basket may or may not be needed and if you are an outdoorsy type you would want to make sure your choice is designed for use away from the home. Strength and stability would then come into play with your decision. As the whole idea behind these products is to provide an option to crutches and adding to your mobility, ultimately you would want a model that does what it is designed to do. Keep your injured leg secure and comfortable while you move about and keep your active lifestyle in place. 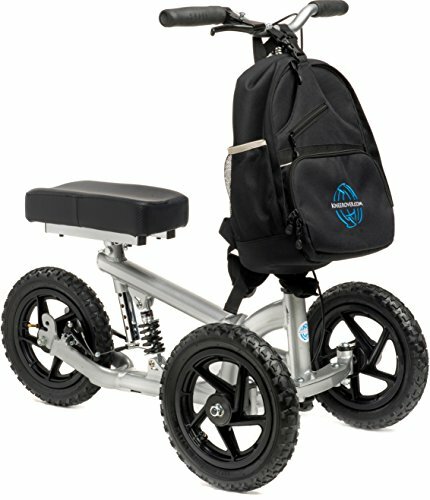 With this in mind, any of the best knee scooter styles reviewed here would be a perfect choice for use during injury or surgery rehabilitation. In today’s age where active lifestyles are more common than they used to be, being laid up nursing an injury or following a medical procedure can have a huge affect on not only physical but mental health as well. Not being able to move around within the home can be frustrating and depressing. Being able to at least manage to have some mobility during rehabilitation will do wonders with self-esteem and assist in speeding recovery time. Depending on how active your lifestyle is, there is no longer anything to fear when faced with a leg, knee or ankle injury. The fact that knee scooters exist address this important issue. 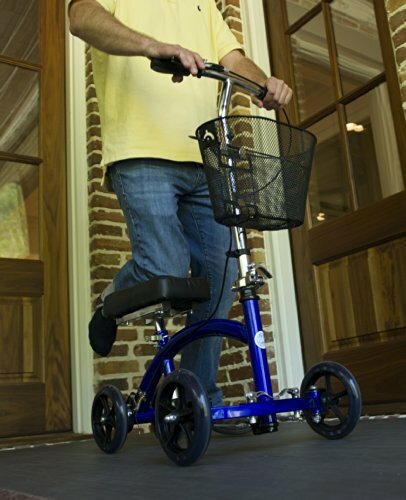 Different models all rely on the same basic design, a wheeled knee platform with handlebars and steering that can be propelled by pushing off with the uninjured leg/foot. 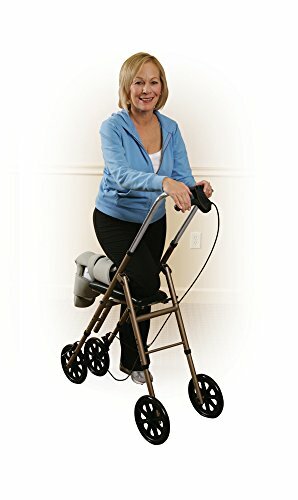 The best knee scooters will keep you moving and part of the active lifestyle you have embraced during the recovery of an injury.